The Guardian Gear Grid Vehicle Barrier pressure mounts to your vehicle. Car travel with pets can be a hassle. From overactive animals roaming in the car to coaxing animals into kennels, the experience can be simply unpleasant. 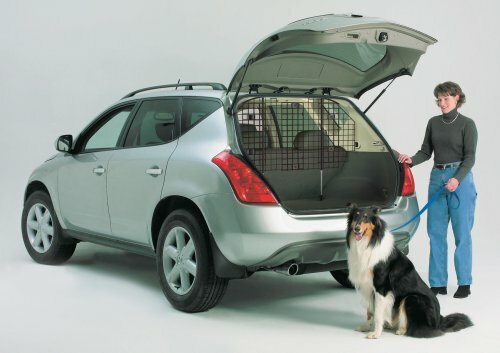 A car pet gate is a great solution for making travel with your fur babies much more efficient and enjoyable. Car pet gates allow you to set up a barrier in your car to designate a space for your pet, so there is no kenneling and you still have control over your pet’s mobility within the vehicle. There are several designs to choose from that will work for the majority of cars, trucks, or SUVs. Most of the models are designed to section off the very rear of SUVs, but some models are designed to just block off a car’s front seats. Many gates feature adjustable widths and heights to easily accommodate various cars. Many car pet gates also make use of pressure mounting so there is no hardware installation to damage your car. Below we’ve put together a list of various car pet gate models that you may find useful for your vehicle. We hope you find the right gate for you and your pet! Hopefully the comparison chart above is useful in getting a quick sense of the variety of car pet gate models available at various price ranges. Below we’ll highlight a few of the most popular options and go into more detail about their features. The Guardian Gear Grid Vehicle Barrier is designed for use in cargo areas of SUVs, minivans, and station wagons. It is made out of heavy-duty tubular steel and wire, and pressure mounts to the floor and ceiling on vehicles to secure into place. This gate features hard plastic feet to diffuse the stress from pressure points and reduce the likelihood of dents in vehicles. Both the height and width of this model are adjustable; the width can span between 30 and 70 inches, while the height can span between 30 and 51 inches. The Bushwhacker® Paws n Claws Deluxe Dog Barrier is designed to affix to the back of front seats to keep pets secure in the back seat area. It attaches to the front seat headrest and either the seat belt mount or around car seat frame, which makes for an easy and convenient mounting method. The barrier is composed of a durable pet screen framed by sturdy metal piping. 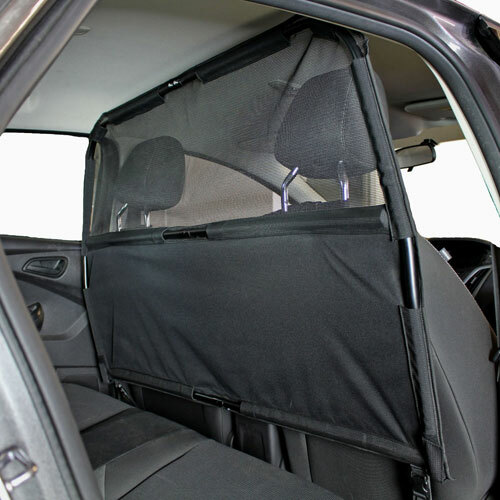 The screen is scratch and tear resistant to keep your pet safe in the back seat. This model has a fixed 50 inch width, so it can not be adapted to fit larger or smaller vehicles. The MidWest Wire Mesh Car Barrier is a long-running top seller in the car pet gate category. It is constructed of wire mesh and designed for use in SUVs, vans, and cross-over vehicles. It keeps pets in the rear of vehicles, leaving the seating area of the cars for humans passengers. This model pressure mounts to the floor and ceiling of a vehicle to make a stable barrier. The legs of the gate are finished in rubber to reduce the stress placed on the points the gate mounts to. This gate features an adjustable frame to function in a variety of vehicles. Its width can be anywhere between 31 and 70 inches, while its height can be 31 to 50 inches.